Video clip synopsis – On January 26, 1788 the British arrived at what is now known as Sydney, New South Wales. From that day on, the lives of Australia’s indigenous peoples, their culture, history and traditions, were forever changed. Broadband MP4 europeanobserve_bb.mp4 (8.1MB), suitable for iPods and computer downloads. European Observers is a video clip from the documentary series and website First Australians produced in 2008 by Blackfella Films for SBS Television. First Australians chronicles the birth of contemporary Australia as never told before, from the perspective of its first people. First Australians explores what unfolds when the oldest living culture in the world is overrun by the world’s greatest empire. discuss and reflect upon the significance to Australians today of first contact by European observers with the indigenous population around the Sydney region in the early days of British colonialism, and of the ways in which these events were understood, interpreted and recorded, and re-examined today in the light of contemporary research and thought. work collaboratively to research, interpret information and and argue a viewpoint on contentious historical material. draw on and extrapolate from their learning to carry out appropriate wider historical research and to construct a creatively-imagined document. January 26, 1788, was a very important day in Australia’s long and ancient history. It was the day on which the British arrived at what is now known as Sydney, New South Wales, with the intention of taking control and possession of the land in the name of the British Government and the King. From that day on, the lives of Australia’s indigenous peoples, their culture, history and traditions, were forever changed, and the effects of this continue to the present day. The role of the new British colony was essentially to provide a jail for transported convicts in order to relieve the badly overcrowded prison system in England. 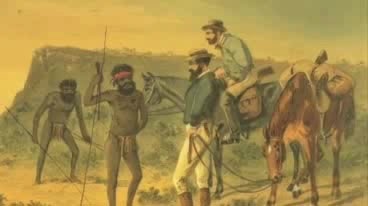 The British believed Australia’s indigenous population to be lacking in any form of government or religion, and would therefore not have considered their arrival on Australian shores an ‘invasion’. There was no written language, and therefore no written records, no deeds of ownership upon which European society functioned. The land was empty. It was terra nullius. Describe and explain the ways in which the details of first contact by Europeans with the indigenous peoples of the Sydney district in 1788 has been pieced together by today’s historians. Explain what historian Inga Clendinnen means, in the clip, where she says that at the time of first contact in 1788 Aboriginal people probably had the “deepest history known to mankind”. Explain the problems to which Professor Marcia Langton refers when we read and view the primary historical records and documents that exist from the time of first European contact with the Sydney nations. Some refer to the arrival of the British in Australia as an “invasion”. As a class, define the meaning of “invasion”. Is “invasion” an historically correct word to use when examining the history of first contact in Sydney? Did the original inhabitants of Sydney regard the British as invaders? Did the British regard themselves, at the time, as invaders? When did the word, “invasion” come into vogue, on this topic, who promoted the term, and why? In pairs carry out research on these issues, then plan and write a considered history-based interpretation, argument and judgement in 500–600 words. Consider an alternative history of Australia from 1788 to the early years of the 19th century looking at what might have happened had the British not settled in Sydney in 1788? Do you think another European, American or Asian power might have colonised and taken possession or not? Explain your views, basing them on historical evidence. You may either present your “history” as an illustrated double-page magazine spread, using desktop publishing, or in display poster format.